Consonants are sounds created by blocking or hindering the passage of air through the mouth in some way. Compare [p], for which you briefly close your lips before forcing the air through, to [a], for which your mouth remains open. Like vowels, consonants aren’t necessarily individual letters, but one or more letters that produce a single sound, such as "ch." Too technical? Try this lesson instead: Consonants for beginners. Every French consonant except r is pronounced closer to the front of the mouth than its English equivalent. The French tongue always remains tensed. 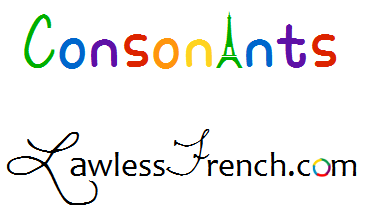 French consonants do not have an initial aspiration, but do have a slight aspiration at the end. For example, when saying "carrot," an English speaker is likely to pronounce the final t without re-opening his mouth at the end, so that sound is quite soft. But in French, the t at the end of "carotte" is followed by a slight aspiration, which results in a distinct t sound. See lessons on specific letters for more information. At the end of words, French consonants are often silent. These voiced/unvoiced pairs are important with regard to liaisons, enchaînement, and assimilation. * Place your hand on your neck and make the sounds "b" and "p" (just the consonant sound, not the name of the letter). You should feel your vocal cords vibrate when you say "b" but not when you say "p." Do the same thing with other pairs and you’ll feel how similar they are, with just the vibration or lack thereof making the distinction. *The equivalent English sounds are alveolar. Sibilants, the “s” sound. The sound I cannot hear; makes plurals difficult. Sibilants are a sub-category of fricative sounds. Not being able to hear them wouldn’t make a difference in French – even though “s” is added to many plurals, it’s not pronounced.